Free Shipping Included! Shun VB0706 Sora Chef's Knife, 8-Inch by Shun at Sara Stage. MPN: VB0706. Hurry! Limited time offer. Offer valid only while supplies last. Chef's knives are tapped to do multiple tasks around the kitchen, and the Shun Sora 8-Inch Chef's Knife will become a go-to knife in your kitchen. 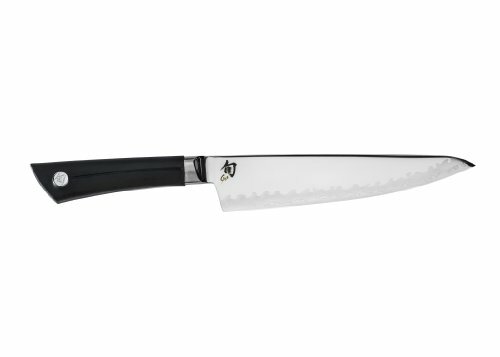 Chef's knives are tapped to do multiple tasks around the kitchen, and the Shun Sora 8-Inch Chef's Knife will become a go-to knife in your kitchen. Sora, in Japanese, means "sky". Let your imagination take you-the sky's the limit with what you can do with your Shun Sora Knives. Featuring our proprietary composite blade technology that brings together a VG10 cutting edge, clad with one layer of stainless steel on each side to create a san mai edge, with a mirror-polished Japanese 420J stainless steel upper. Boasting a razor-sharp 16-degree cutting angle on each side of the blade, Sora puts all the high-performance technology where it's needed most: the cutting edge. Laser-cut, 2-sections are fit together and braze welded to permanently join them. Blade shapes and handles are designed for traditional Japanese knives, while the beautiful wavy pattern on each blade is reminiscent of Japanese sword hamon lines. Each handle is made with a textured TPE polymer handle that provides balance, and is easy to maintain. The texture of each handle provides a tacky surface when wet, making them superior to use around juicy fruits, vegetables and meat. A stunning Shun knife at an incredible price point; you can afford to have one in every style!